AS it turns out, last weekend was a pretty good one for Louisiana’s two main football teams. The Saints picked up a crucial NFC South Division road win by knocking off the Falcons in overtime, while LSU took care of business, if in somewhat uninspired fashion, with a 38-17 cruise past Louisiana Tech. The Tigers’ effort followed what is now their usual pattern over the first four games of the season – jumping out to a lead off a strong performance to open the game, then suffering a lull allowing the opponent to seize momentum before righting the ship late in the game. This happened in the opener against Miami, when LSU jumped out to a 27-3 halftime lead and then built it to a 33-3 advantage, then giving up a couple of touchdowns before the defense responded to close out the game. Against Southeastern Louisiana, it was something similar: a 24-0 halftime lead, then a listless performance before a Jacory Stevens fumble return set up the game’s final touchdown. Against Auburn LSU jumped out to a 10-0 lead, then allowed 21 straight points before mounting a comeback leading to the Cole Tracy game-winning field goal. And against Tech, it was a 24-0 second-quarter lead before giving up three straight touchdowns to make the game temporarily close, after which LSU’s offense woke up again for a pair of touchdowns to put the contest away. Defensively, it almost seems like the Tigers get bored with their opponents after shutting them down early. It might be that if the Tiger offense were able to sustain a bit more scoring pressure, particularly in the middle of games, the focus level on the defensive side of the ball would be higher and more consistency would result. To achieve that offensive end, though, could be difficult – we’re a bit concerned the Tigers just don’t have enough playmakers. LSU has developed a perfectly serviceable pair of running backs in Clyde Edwards-Helaire and Nick Brossette, who combined for over 200 yards and five touchdowns in the Tech game. Neither one possess the kind of top-end speed that a Derrius Guice or Leonard Fournette spoiled LSU fans with, and as a result the LSU running attack doesn’t seem to have a great big-play capability to it. This wouldn’t be a major problem, but for the fact that the passing game hasn’t turned up much big-play capability, either. Other than a 71-yard catch-and-run TD Derrick Dillon turned the Auburn game around with, there hasn’t been an example of an LSU wide receiver blowing past the defense in the first four games. That suggests this team might not have a vertical threat on the flanks to keep defenses honest. Sure, with the size of Dee Anderson and Stephon Sullivan there are mismatches which can be exploited on 50-50 balls down the field, but that’s not the same thing as taking the top off a defense with a D.J. Chark on a deep post or fly route. Until LSU develops a reliable long-ball threat, or even a big-time catch-and-run threat in the passing game, the offense is going to have to rely on grinding out first downs one after the other, and then executing in the red zone, in order to score points. That’s tough to do consistently, especially against good defenses. And as tough as the schedule has been it’s only going to get harder. They’ve got to improve, or they’re not going to be able to hold on to that lofty No. 5 national ranking the Associated Press gave them Sunday. As for the Saints, making plays on offense is most definitely not the problem. Drew Brees came into the Atlanta game completing an astonishing 80 percent of his passes and didn’t let that number slip – Brees was 39 of 49 for 396 yards and three touchdowns, and for good measure he added a pair of rushing touchdowns. That made him the NFL’s top passer on Sunday, and it also made his two top receivers – Michael Thomas (10 catches, 129 yards) and Alvin Kamara (15 catches, 124 yards) among the NFL’s leaders. But for all the fireworks, it was a razor-close win – because the Saints’ secondary, which was badly torched in the season-opening loss to Tampa Bay, reared its head again. Fourth-year cornerback P.J. Williams got the start over the struggling third-year man Ken Crawley, and proceeded to get himself burned to a crisp by rookie Atlanta receiver Calvin Ridley throughout the first half. Crawley then supplanted Williams and was burned a pair of times himself. Then nickel cornerback P.J. Robinson suffered a high ankle sprain, forcing the Saints to use both Williams and Crawley at the same time. If it wasn’t for the Saints’ defensive line stepping up in a big way late in the game, there is little chance this game could be won. 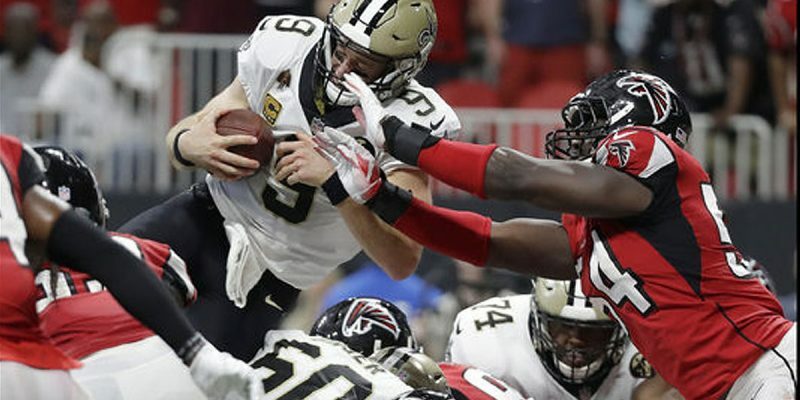 But the defense did manage to hold Atlanta off late in the fourth quarter, enabling Brees to engineer a touchdown drive to tie the game and send it to overtime, and the Saints then won the toss and proceeded to grind out what for Falcons fans had to be an excruciatingly painful 15-play, 80-yard drive covering more than seven minutes and finishing with a Brees dive over the pile for the final touchdown. Next Article Y’all Wanna Hear A New Boudreaux & Thibodeaux Joke?